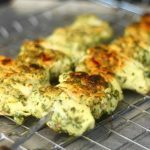 This recipe for Chicken Kebabs is absolutely delicious and perfect for a summer BBQ or get together. The lemon juice ensures soft and juicy chicken whilst the mint and coriander packs a fill your face summer flavour punch worthy of a whole winter of rain. Place all the ingredients apart from the chicken and olive oil in a food processor and blitz until as blended as poss. Add the olive oil to loosen into a paste. You may have to scrape the bowl down a couple of times to make sure it all gets blended enough. Empty the paste into a medium size bowl and tip the chicken into and give it all a good squish about. Cover and leave for at least an hour in the fridge. Thread the chicken onto your skewers and BBQ these beauties for about 5 mins. Obvs it depends on the temp of the BBQ but just cut one through to make sure it's cooked. If the British Summer lets you down then feel free to bake in the oven at 200C for 10-15 mins. Again cut one open to check it's cooked through.